Status vs. Sales Steps · You Don't Need a CRM! When managing your leads there are several aspects that you need to know, two of which are important ones: where in the sales process a lead is (sales funnel) and what’s it’s status (closed or alive)? Knowing these elements will help you optimize your sales process. The main difference between these two elements is that the sales process is variable from one company to another, whereas statuses stay unchanged. In every sales team out there, the statuses are: either I have something to do with the lead right away (To-Do), I will have something to do at some point (Standby), I closed the deal (Won), I lost it against a competitor (Lost), or the sale dropped for some reason (Cancelled). The status *cancelled often doesn't exist in other software, but we believe there's a big difference between losing against a competitor and not closing the deal because the project ended up not going through. On the other hand, it’s not possible to create an exact list when it comes to sales steps because, not only do they vary from one company to another, but also from an individual product or service to another. 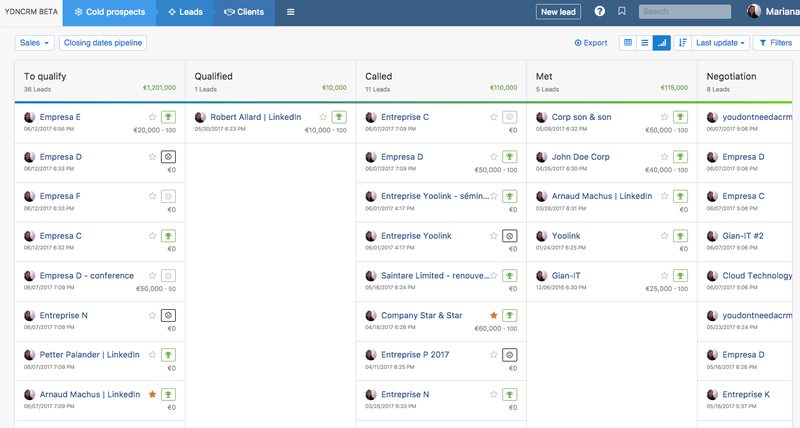 Inside no crm.io you can define each step of your own sales funnel so that it corresponds to your company’s needs, and it’s the same for every sales person inside the company. For example: To Qualify > Contacted > Visited > Quotation > Closing. However, statuses can’t be changed. To-Do / Standby / Won / Lost / Cancelled always stays the same. We suggest that you don't create too many sales steps. Above 7 or 8 and it becomes difficult to visualize and manage. Most importantly, do not create sales steps that replicate the statuses, you need to clearly define the difference in these before you set up. If after your sales cycle there's another process of follow-up you need to start, then you can create a sales step such as "after sales" or "follow-up".